In January, 2018, oral histories that reflect on the African American community in Nyack were collected in a weeklong, public information-gathering session in the window of a downtown record shop. Bill Batson, in cooperation with the local churches and families of the black community, undertook an ambitious effort to give a voice to a group whose history is often overlooked: the African American community. The HSRC was a proud sponsor of this project, and we are delighted that Bill Batson will come to the HSRC to share it with our members and friends. The Nyack Record Shop Project was planned in conjunction with the Edward Hopper House exhibition "Carrie Mae Weems: Beacon" and pays homage to Carrie Mae Weems's "Record Shop" (commissioned by David Ross and the Beacon Cultural Foundation). 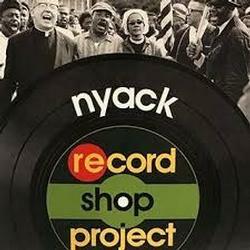 For information about the Nyack Record Shop Project, go to https://www.facebook.com/events/207196049838275 or visit the Edward Hopper House website at http://www.edwardhopperhouse.org/nyackrecordshop.html. About the speaker: Bill Batson is an artist, writer and activist who has worked for nonprofits, labor unions, and government in New York State as an organizer, writer, and public relations specialist. Since August 2011, he has contributed a weekly sketch and short essay for a column called Nyack Sketch Log for NyackNewsAndViews.com.He is also a contributor to the New York History Blog. In 2012, Bill became the artist-in-residence at the year-round Nyack Chamber of Commerce’s Farmers’ Market, and as a Trustee of the Historical Society of the Nyacks, he curated the exhibition "African Americans in the Nyacks 1800- Present." In 2015, he chaired the Nyack Commemoration Committee, an effort that successfully established a Toni Morrison Society “Bench by the Road” monument in memorial , and in 2018, he directed the Nyack Record Shop Project, a community component of the Carrie Mae Weems exhibit at the Edward Hopper House that collected three dozen oral histories of the local African American community. Bill’s writing has appeared in Essence magazine, New York’s Amsterdam News, and The Argus in Cape Town, South Africa.